It takes quite a bit of fuel to power the airplanes, ships and trucks that deliver produce from foreign countries or for miles across the United States so that it can be served up on our plates. Buying local food means less fuel is used and fewer emissions expelled into the atmosphere. That is win for our health and the planet. In order to keep food looking and tasting fresh during its long transport, it is sprayed with all sorts of preservatives such as waxes and fungicides. Local food does not to be stored for a long time and therefore does not need artificial preservatives. 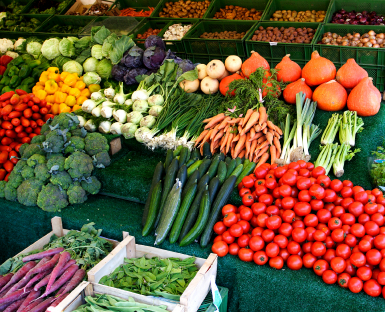 At a farmer’s market you are likely eating produce picked that same day… not a week previous. Local produce is in sync with your body as discussed in the book Eating With the Seasons: How to Achieve Health and Vitality by Eating in Harmony With Nature. Your blood actually changes with the seasons, and your body adjusts to the change in temperature and light. It stands to reason that foods grown during the current season, in your area, are exactly what your body needs and what is more healthful for you. Your body is likely to be more receptive to digesting and absorbing the nutrients of seasonal foods as well. Local organic food is also fresher, and fresher is healthier. Local produce that is in season is more affordable than food that has to be shipped. All the transportation and preservatives cost money. It’s also more expensive to grow food out of season. You also support your local community when you buy local and building a strong, close community is important to everyone’s health and prosperity. Dollar for dollar your money goes twice as far when you spend it with a neighbor and really wouldn’t you rather do that than give it to big agribusiness?